Both Pink and Blue Hyssop are lovely additions to any garden but are especially welcome in colder climates where colorful summer perennial choices are limited. On the other hand, they do equally well at battling our blazing summer sun and they have the added benefit of attracting beneficial insects. They can be cut back to the ground and in the spring each plant will push up multiple stems all covered with pink flowers in early summer. Pink Hyssop makes a great addition to our Wildlife Herb Garden and is sometimes included in our English Cottage Herb Garden Six Pack. This plant is sometimes available in a plug tray. These trays hold 128 of all the same plant. They are a great low cost way to fill a lot of space. Each cell is 3/4 of inch by an inch. 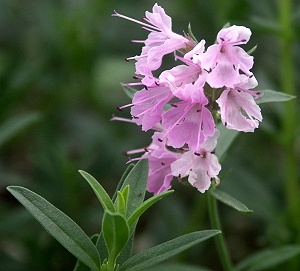 Check here to see if Pink Hyssop Plug Trays are available.